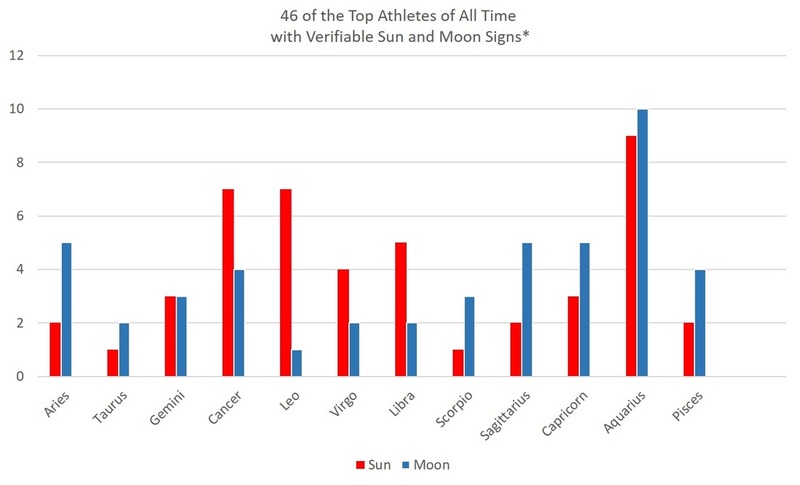 One astrological sign tops the list as the most common sun or moon sign for top athletes! Two other signs are severely lacking from the list. 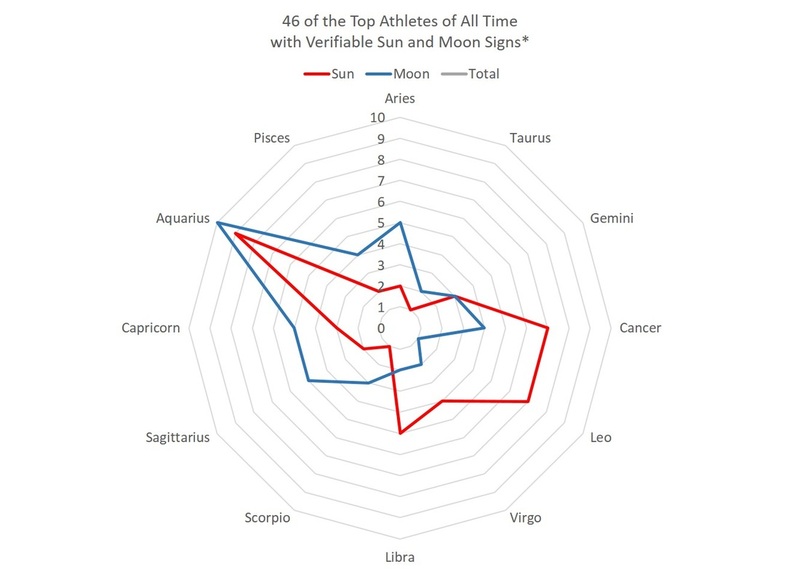 We performed a search to find any noticeable trends in the sun and moon signs of top athletes. The results were quite interesting. Aquarius stands out as being the most prevalent sun and moon sign. 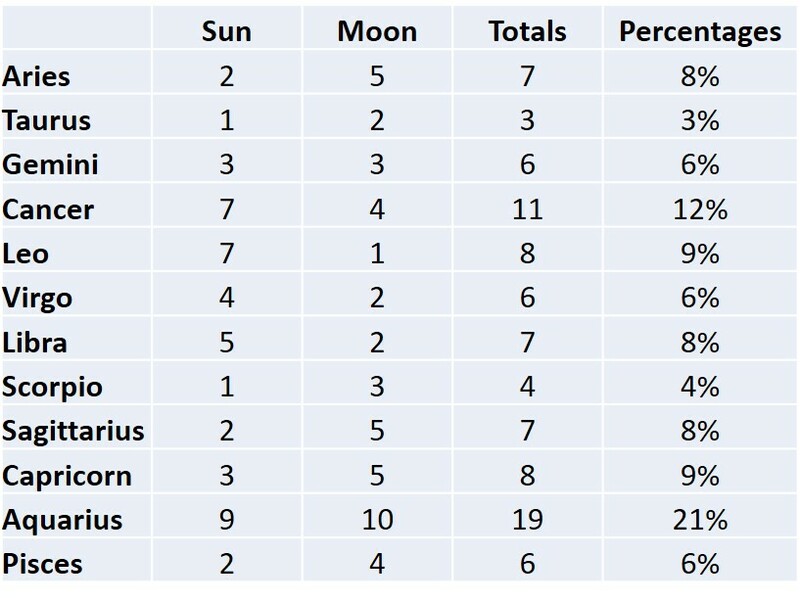 Taken together, 21% of either the sun or moon positions are held by Aquarius. Cancer is next in frequency. 12% of all possible suns or moons are found in the sign of Cancer. The signs found least frequently are Scorpio with 4%, and Taurus, with only 3%. See the chart below for the totals. It's commonly known that January and February are actually two of the months with the fewest births, so a higher number of births in the time around Aquarius does not explain why so many top athletes have their sun or moon in Aquarius. Moreover, the high number of Aquarius moons cannot be explained away by any birth-month frequency theories. The moon changes astrological signs approximately every 2 to 3 days. A random search of the top athletes of all time was gathered. The list is in no particular order. There are some athletes who are considered excellent, but their sun or moon signs could not be verified. They could not be included.